Charlotte, NC (April 1, 2015): Custom Classics™ by David Weekley Homes has begun construction on luxury homes in Melody Woods. Nestled in Myers Park and close to Freedom Park, this enclave will feature eight English cottage-style homes, with five being built by David Weekley Homes and three by Pace Development Group. Three of the eight homes are currently under contract. The first available home will be The Parkhurst on homesite six, which features 4,200 square feet of living space, filled with four bedrooms, three full baths, one half bath, a formal dining room with ceiling beams, a study with French doors, a family room with 20-foot ceilings and fireplace, and a kitchen overlooking the breakfast area. Designer touches inside the home include a butler’s pantry, a significant curved staircase, screened-in porch with fireplace and wood deck, and an English cottage exterior with stucco and stone. The first floor also includes a two-car garage and a sizeable owner’s retreat. A second staircase along the kitchen and garage will lead upstairs to a retreat and additional bedrooms and baths, including a Jack-and-Jill bath. The Bravada is slated to begin construction soon on homesite two and will feature four bedrooms, four full baths and one half bath within 3,800 square feet. This plan includes an owner’s retreat and guest suite on the main floor, a two-story family room with fireplace and built-in bookshelves, a first-floor study with French doors, a dining room with 11-foot ceilings and a kitchen with Weekley’s signature large island. The Bravada will also have a three-car garage, an outdoor living area with a fireplace, a retreat with nine-foot ceilings and an English Tudor-style exterior. 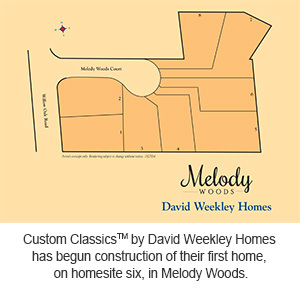 For more information about Custom Classics by David Weekley Homes in Melody Woods, please contact Jenny Miller at 800-393-9968.